The Graduate Program in Organismic and Evolutionary Biology at University of Massachusetts Amherst announces a two-year postdoctoral FELLOWSHIP/lectureship. OEB draws together more than 90 faculty from the Five Colleges (University of Massachusetts Amherst and Smith, Hampshire, Mount Holyoke and Amherst Colleges), offering unique training and research opportunities in the fields of ecology, organismic and evolutionary biology. Our research/lecture position provides recent PhD's an opportunity for independent research with an OEB faculty sponsor, as well as experience mentoring graduate students and teaching a one-semester undergraduate biology course. To be qualified, a candidate must have a recent PhD in a field relevant to ecology, organismic or evolutionary biology and proven teaching skills. Position subject to availability of funds. Also please arrange to have a letter from your proposed OEB faculty sponsor sent to oeb@bio.umass.edu. A list of OEB faculty and additional information is available at http://gpls.cns.umass.edu/oeb. Applicants should apply by the priority deadline of December 15, 2018 in order to ensure consideration. The position is expected to start in August 2019. Questions about this search may be sent to: oeb@bio.umass.edu. The Darwin Fellow Program, founded in 1995, brings promising young postdoctoral researchers to UMASS Amherst. The two-year position provides a unique combination of teaching and research responsibilities and is excellent preparation for academic positions. The fellowship program embodies the interdepartmental collaboration that characterizes the OEB Graduate Program. Darwin Fellows are active participants in OEB, acting as mentors to graduate students, conducting research, leading seminar courses, and teaching courses in the Biology Department. Dr. Sarah Emel is interested in understanding the evolutionary dynamics of species’ responses to human habitat alteration to improve conservation management. Her work integrates population genetic theory and spatial statistical approaches with large genomic and geographic information systems (GIS) datasets to understand the roles of relevant landscape and climate variables. Sarah uses genomic tools to characterize both neutral and adaptive genetic differentiation across the landscape in non-model organisms. She aims to inspire future generations to appreciate biology and conservation of biodiversity through a combination of teaching and mentorship. 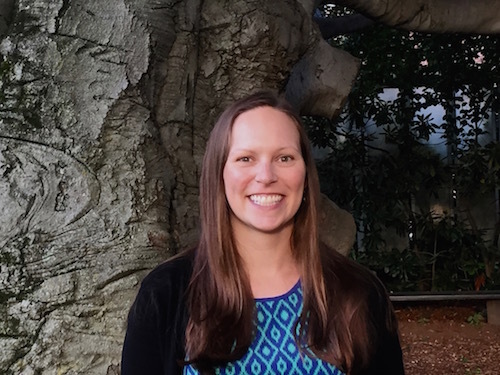 Sarah received her Ph.D. from the School of Biological Sciences at Washington State University in 2015, where, as a member of Andrew Storfer’s lab, she applied landscape genetic approaches to understand landscape use for dispersal by two members of the understudied torrent salamander family. Her work confirmed the importance of stream corridors for movement between populations, and highlighted the need to conserve landscape features that minimize desiccation in a region dominated by timber harvest. Next, Sarah pursued a postdoctoral fellowship in Rachel Spigler’s lab in the Department of Biology at Temple University. At Temple, she expanded the taxonomic scope of her work by applying landscape genomic tools to investigate the relative impacts of agriculture, forest, and urbanization on connectivity among populations of the flowering plant rosepink in the Serpentine barrens of southeastern Pennsylvania. She also studied the role of pollinator service in shaping selection on attractive floral traits. As a Darwin fellow, Sarah will be working with Chris Sutherland on the genomic basis of metapopulation dynamics in endangered water voles, as well as genetic species identification and structure in small North American carnivores. 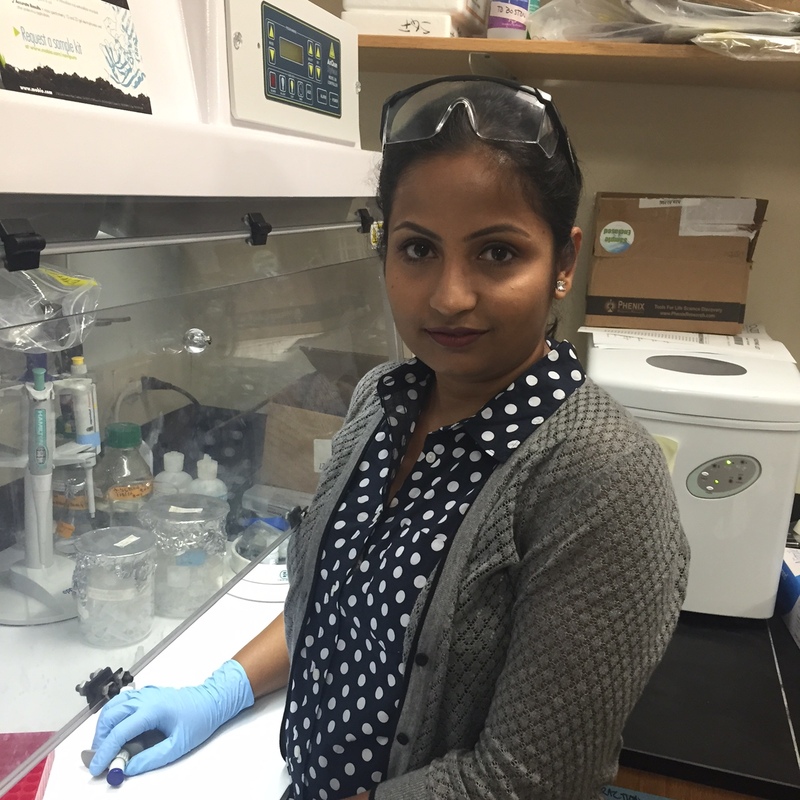 Dr. Priya Roy Chowdhury studies the mechanisms underlying species’ responses to rapid human-induced environmental changes. She uses a combination of genetic, molecular, and physiological approaches to determine how materials and energy pathways are influenced by temperature and nutrient gradients – two most pressing environmental problems of present time. Specifically she focuses on how organisms deal with long term increase in dietary phosphorus content and increased temperatures at multiple levels of biological hierarchy. She received her PhD degree in Zoology from Oklahoma State University in 2014. During her PhD tenure, she worked with century-old resurrected eggs of Daphnia (water-flea), making it possible to compare ancient population with contemporary populations from the same habitats. Such “time travelling” substantially increased our predictive power in understanding the effects of environmental change at the elemental, genetic, individual, population as well as entire community levels. After her PhD, she joined the Earth and Environment department at Boston University as a postdoctoral fellow. Here, she studied how nitrogen (N) cycling communities and thus N cycling processes are modified by human altered habitats such as oyster farms and how such changes influence sediment fluxes of greenhouse gases such as nitrous oxide. As a Darwin fellow, she will be working with Dr. Kristen DeAngelis on the effect of long-term environmental stress (global warming and nitrogen deposition) on microbial community dynamics. Dr. Daniel Moen is interested in phenotypic diversity, comparative biology, and amphibians and reptiles. His research focuses on understanding the ecological and evolutionary origins of phenotypic diversity in communities and regions. 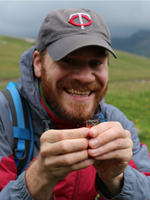 To this end, Dan's research integrates data on phylogeny, biogeography, ecology, morphology, and functional performance in frogs and toads (sometimes all in the same study!). Because he is often comparing many species with new phylogenetic statistical methods (both his own and recently published), Dan also spends lots of time behind the computer while programming. While originally a budding ichthylogist, Dan discovered amphibians and reptiles at the end of his undergraduate education and has never turned back. This led him to a Ph.D. at Stony Brook University with John Wiens, where he began to do much international fieldwork (to Australia, China, and Colombia) to collect data on frog jumping, swimming, and clinging performance. Later he moved to the École Polytechnique and the École Normale Supérieure (in Paris, France) to do a post-doc (with Hélène Morlon) much more focused on the computational side of his research and studying diversification (estimating speciation and extinction rates with phylogenies). As a Darwin Fellow, Dan was part of Duncan Irschick's lab. Dr. Moen is now Assistant Professor in the Department of Integrative Biology at Oklahoma State University. Dr. Sevan Suni studies the ecology and evolution of species interactions, the effects of ecology and environmental changes on genetic variation, and applies population genetic information to conservation. She focuses mainly on plant-pollinator interactions due to the central importance of pollinators both for ecosystem health and the global food supply. She received her PhD from Stanford University, where she provided one of the first genetics-based estimates of dispersal distance in a species in which traditional mark-recapture methods were impossible. As a NIH postdoctoral fellow at the University of Arizona she used orchid bees as a model system to investigate the effects of habitat fragmentation on pollinator dispersal. As a Darwin Fellow she worked with Dr. Andrew Whiteley to link pollinator foraging and dispersal behavior to gene flow in plant populations. Dr. Anne Leonard studies the function of signal complexity. Many organisms produce signals that span multiple sensory modalities, despite the costs and risks of producing a complex and conspicuous display. What benefit does a multi-component signal provide senders and/or receivers? What decision rules do receivers use to compare alternatives that differ in several attributes? Anne first explored these questions in her dissertation research at the University of California, Davis with Ann Hedrick. Her projects addressed how and why female field crickets use both acoustic and chemical signals in mate choice. Anne’s interest in complex signaling led to a postdoc at the University of Arizona with Daniel Papaj, where she sought to understand the function of complex floral signals. Her research on bumble bees (in collaboration with Anna Dornhaus) has demonstrated that addition of a floral scent enhances a pollinator’s ability to visually discriminate between similar flower types. Ultimately, a multimodal floral signal should thus benefit the plant by increasing the chances that a bee will remember its floral display and transfer pollen between conspecifics. As a Darwin Fellow, Anne will pursue her interests in signal complexity and decision-making under conditions of uncertainty. With Lynn Adler she plans to explore how nectar alkaloids may mediate bees’ learning about other floral traits. With Elizabeth Jakob she will use an eyetracker device to determine the visual strategies jumping spiders use to discriminate between similar prey items that differ in palatability. 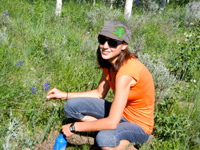 In Fall 2012, Anne joined the Biology Department at the University of Nevada Reno as an Assistant Professor. Dr. Laura Ross received her PhD degree from the University of Groningen in the Netherlands. The focus of her research is to understand the extensive variability in the way individuals of different species reproduce and how their genes are inherited from generation to generation. This large variability is puzzling as these processes are so fundamental for life. A recent hypothesis suggests that reproductive processes might be variable because they are affected by the evolution of "selfish" genes that try to increase their own frequency in the next generation by hijacking the reproductive machinery. These genes are often harmful for the individual they are in and therefore other genes are selected to suppress the selfish ones. This results in what is called genetic conflict. During her PhD she explored this hypothesis focussing on one particular group of organisms, the scale insects, which are characterized by their incredible variation in weird reproduction and genetics and used a combination of comparative, theoretical and experimental approaches to suggest that some of the unusual ways in which scale insects reproduce might have indeed evolved as a result of genetic conflict. While a Darwin Fellow she will work with Dr. Benjamin Normark to continue her work on genetic conflict in scale insects. More specifically she will develop molecular methods that will allow her to test some of the predictions outlined during her PhD. Dr. Ross is now a Newton International Fellow at Oxford University. The fellowships are jointly awarded by the UK’s national research academies – the British Academy, The Royal Academy of Engineering and the Royal Society. Dr. Jaime Tanner received her Ph.D at Michigan State University under Dr. Kay Holekamp where she studied the development of skull morphology and feeding performance in wild spotted hyenas. She used a combination of morphological, behavioral and performance data to shed light on the role of developmental constraints in the evolution of behavior in this unique species. As a Darwin Fellow, Jaime is working with Dr. Betsy Dumont at UMass Amherst and will continue studying the relationships between morphology, ontogeny and performance in carnivores. This research will combine fieldwork and the development of new techniques to link geometric morphometric assessments of shape with 3D mechanical analyses. Upon completing her Darwin Fellowship, Jaime joined the Biology faculty at Marlboro College. Dr. Ted Stankowich studies antipredator behavior, risk assessment, and flight decisions in animals and is interested in understanding the influence of natural selection on the cognitive processes involved in animals’ assessments of predators and the ecological factors that influence the decision to flee during predatory encounters. 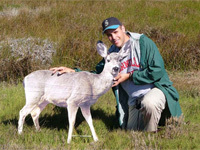 Ted received his Ph.D. in Animal Behavior from the University of California, Davis working on predator recognition, risk assessment, and antipredator behavior in Columbian black-tailed deer. As a Darwin Fellow, he worked with Elizabeth Jakob at UMass Amherst on antipredator responses in jumping spiders and the effects of individual variation in antipredator behavior on responses to familiar and unfamiliar predators. Ted is now an Assistant Professor of Biological Sciences at California State University, Long Beach. Dr. Toby Kiers received her PhD from University of California, Davis under R. Ford Denison. She is interested in the evolution and maintenance of cooperation between species. In her research and collaborations, she asks the question: Why do symbionts provide services to a host at a cost to themselves? One idea is that cooperation between species can be enforced if individuals are able to actively reward good partners or punish less cooperative ones. Using the legume-rhizobia mutualism and the symbiosis between plants and arbuscular mycorrhizae, she investigates punishment (sanction) mechanisms and other methods of indirect resource control bypartners. As a Darwin Fellow, she worked with Dr. Lynn Adler to examine cooperative stability in an obligate pollination mutualism. Dr. Kiers is also interested in how to integrate evolutionary theory with practical on-farm application, with the goal of understanding how agricultural practices influence the performance and evolution of symbiont communities in cropping systems. Dr. Kiers is now on the Faculty of Earth and Life Sciences at the University of Amsterdam. Dr. David Lahti received a PhD in philosophy from the Whitefield Institute, Oxford; and a PhD in ecology and evolutionary biology from the University of Michigan, under Dr. Robert B. Payne. At Michigan he examined the evolutionary consequences of the introduction of the African village weaverbird into new habitats. This research dealt with avian brood parasitism, rapid evolution, local adaptation, and changes in traits in response to changes in natural selection. As a Darwin Fellow he worked with Dr. Jeff Podos and taught Evolution. Through summer 2009 he continued to work on evolution and behavior in weaverbirds with an NIH-funded postdoc, and continued his collaborations with Dr. Podos on the importance of vocal constraints in the evolution of complex song in birds. 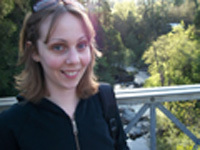 Lahti began a position as an Assistant Professor of Biology at Queens College CUNY, in fall 2009. Dr. Geoff Morse works on the interface between ecological differentiation and evolutionary diversification. As a graduate student with Dr. Brian Farrell at Harvard University he focused on the role of ecological interactions in structuring the trajectory and tempo of phylogenies within the bruchine seed beetles. Research included phylogenetic analysis at the subfamily level, and interspecific phylogeographic and population structure analyses. During his Darwin Fellowship he will work with Dr. Ben Normark to examine the interaction between genetic system, phylogenesis, geography, and ecological interactions in structuring the diversification of diaspidid armored scale insects. Dr. Morse has accepted a faculty position at the University of San Diego. Dr. Dianne Baker received her Ph.D. from the University of Washington's School of Aquatic and Fishery Sciences where she studied the central mechanisms mediating the relationship between energy balance and age of pubertal development in salmonids. As a Darwin Fellow she worked with Dr. Stephen McCormick at the Conte Anadromous Fish Research Laboratory and taught Physiology. Dr. Baker is now Associate Professor of Biology at the University of Mary Washington. Dr. Barbara Whitlock received her Ph.D. from Harvard University in 2000, working with Dr. David Baum. 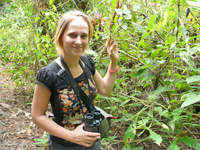 Much of her dissertation research focused on a group of primarily tropical and subtropical plants in the family Sterculiaceae ("the chocolate family") that shows extraordinary morphological diversity in flowers and fruits. She is interested in reconstructing Angiosperm phylogenies at all taxonomic levels to address fundamental questions on the evolution and diversification of flowering plants. As a Darwin Fellow, she worked with Dr. Yin-Long Qiu examining molecular rates in early Angiosperm lineages. She is currently an Associate Professor in Biology at the University of Miami. Dr. Andrew Hendry received his Ph.D. under Dr. Thomas Quinn at the University of Washington (1998), and did postdoctoral work under Dr. Eric Taylor at the University of British Columbia. He is an evolutionary ecologist. with interests in (1) interactions between selection and gene flow during adaptive population divergence, (2) spatial and temporal scales of population structure, and (3) patterns and rates of micro-evolution in contemporary populations. A recurring theme of my research is the testing of evolutionary theory using empirical data gathered from fishes. While a Darwin Fellow, Hendry worked with Dr. Ben Letcher to apply evolutionary theory to issues in Atlantic salmon restoration. He is now Associate Professor of Biology at McGill University. Dr. Jim O'Reilly received his Ph.D. in from Northern Arizona University in 1998. He worked in the laboratory of Dr. Elizabeth Brainerd where he investigated the evolution of the physiological basis of movement in vertebrates, the emergence of novel complex functional systems during vertebrate evolution and the natural history of reptiles and amphibians. Dr. O'Reilly is currently a Senior Lecturer in the Department of Organismic Biology and Anatomy at the University of Chicago. Dr. Karen Kellogg, who received her Ph.D. under Dr. Jay Stauffer at Penn State University in August, 1997, is a behavioral ecologist studying the evolutionary processes that gave rise to the diverse cichlid fishes of Lake Malawi, Africa. She worked in the laboratories of Dr. Francis Juanes and Dr. Katherine Fite. Dr. Kellogg is Associate Professor of Environmental Studies at Skidmore College. Dr. Andrew Simons is a molecular systematist who received his Ph.D. from the University of Alabama. During his Darwin Fellowship. he investigated the evolution, morphology, behavior and biogeography of fish while working with Dr. William E. Bemis. Dr. Simons left his fellowship early to begin a faculty position at the University of Minnesota where he is now an Associate Professor. Dr. Alison Hunter received her Ph.D. in Ecology in 1992 from McGill University. Her background is in terrestrial population and community ecology. She worked with Dr. Joseph Elkinton, Professor of Entomology, where she investigated gypsy moth phenology relative to host budburst. She is currently at the University of Chicago. Dr. Paul Morris received his Ph.D. in Geology from Harvard University in 1991. His specialty is invertebrate paleontology. Morris worked with Dr. Emily CoBabe, Assistant Professor of Geosciences, where he examined the extent to which environmental change correlates with ecological and evolutionary change in the fossil record. He is the Biodiversity Informatics Manager at the Harvard University's Herbarium and Museum of Comparative Zoology.